Throughout history, in every field, there are those men who do not achieve greatness themselves, but inspire it in others. Peter McWilliam was one of those men. A name that means little to most today, McWilliam was a classy left-half, whose career spanned only 11 years, starting at Inverness Thistle, before 9 very successful years in the North East with Newcastle United. At Newcastle, McWilliam played alongside fellow Scot Robert Smyth McColl, who first introduced him to the style of play that McWilliam would go on to implement in management, and have a gargantuan impact upon the game, not just in Britain but on the continent as well. He is best remembered for his 19 years as Spurs manager, in two separate spells, which sandwiched a seven-year stint at Middlesbrough, the only other managerial post McWilliam ever held. McWilliam began playing for his hometown team of Inverness Thistle in 1900, aged 20, but remained at Kingsmills Park for only two years, before heading south of the border where he joined Newcastle United. His first campaign in the North East was not a memorable one, as the Magpies finished in 14th, but this was soon shown to be merely a blip, as the team became a formidable force in English football over the next few years. They finished 4th in the following season and a year later McWilliam had his first taste of silverware, as Newcastle won the First Division title. In less than a decade at Newcastle, McWilliam won three league titles, reached five FA Cup finals, won one, and added a Charity Shield to their impressive list of achievements. Over this period, no team in England had such sustained success as Newcastle, whose record of reaching 5 FA Cup finals in 7 years and reaching a semi-final in one of the others represented a quite incredible feat, at a time when the competition was seen as the pinnacle of the English game. Pivotal to Newcastle’s success was their new and seemingly innovative way of playing the game. At the turn of the century, Scottish side Queen’s Park was considered the epicentre of the ‘combination game’. Founded in 1867, at a time when football was very much focused on the individual and dribbling abilities, Queen’s Park began to implement a more passing-based style, and are considered pioneers of the modern passing game. Nicknamed ‘Peter the Great’, McWilliam was an immensely popular figure in both Scotland and Newcastle. His career ended prematurely, aged just 31, when he was injured on internationally duty away in Wales whilst captaining the side in the Home International Championship. He retired from a short bur highly successful career, having played 241 games for Newcastle, in which he scored 12 goals, and having won 8 caps for Scotland, including captaining his national team. McWilliam wasted no time in getting back into the game. A year after having his playing career cut short in front of 14,000 spectators at Ninian Park, he was announced as the new Tottenham Hotspurs manager. The former Scotland captain would go on to spent 19 years as Spurs boss, in two separate spells, although both were interrupted by the First and then the Second World War. When he joined Spurs in 1912, he joined a side in their Football League infancy. Tottenham had only been elected to join the Football League in 1908, and although they had experienced great success in the non-leagues, most notably winning an FA Cup, the transition to life in the Football League was sure to take some time. Successive 17th placed finished were followed by relegation in his third season, which co-incdided with the outbreak of the First World War and the suspension of the Football League in 1915. A sign of the times, such a record would undoubtedly see a modern manager out of the job, but the Tottenham board stood by their appointment, and McWilliam remained in place. Football in England resumed 4 years later, when Tottenham found themselves in the Second Division. The years which immediately preceded WWI would go on to be McWilliam’s most successful in management. Spurs won the Second Division at a canter at their first time of asking in the 1919/20 season. This was followed up by an impressive sixth placed finish in the First Division and an even more impressive FA Cup win, as a second-half strike by Jimmy Dimmock gave Tottenham a 1-0 win over West Brom. A league title almost followed in the next campaign, as Spurs finished second only to Liverpool in the 1921/22 season, also adding a Charity Shield win that year in the perennial season curtain opener at Wembley. A second placed finish and an FA Cup triumph was a fine achievement with a young Tottenham team, who began playing a style new to almost the entire squad, picked up by McWilliam from McColl at Newcastle. It would, however, prove to be his greatest achievements in management, and the next five seasons could, at best, be described as mid table obscurity for Spurs, finishing; 12th, 15th, 12th, 15th and 13th. In 1927, McWilliam left for pastures new, returning to the North East, this time as manager of Middlesbrough. This was not a switch the Scot had been keen to make, but when Middlesbrough dangled a contract worth £1,500 in front of him, it was hard to say no. Still, McWilliam went to the Tottenham board and informed them of his intentions to stay in North London, if only they’d increase his wage of £850 to £1,000, still considerably less than he would earn at Middlesbrough. Despite his immense popularity and reasonable requests, Tottenham refused, and McWilliam moved on. In his absence, Tottenham were relegated, but so too were Middlesbrough. Spurs though, unlike Boro, were not able to bounce back at the first time of asking. McWilliam made it two from two with Middlesbrough, adding a second Second Division title in the 1928//29 campaign. Over the next five seasons, McWilliam succeeded in keeping Middlesbrough in the top flight, but only just. A club joint second highest First Division finish of 7th marking a rare season of success in a spell largely focussed on survival, and best remembered for the remarkable goal scoring feats of Boro legend George Camsell. McWilliam left Middlesbrough in 1934, and took a 4 year break from the sport. During this time the former wing-half turned down the opportunity to succeed the legendary Herbert Chapman at Arsenal, and was eventually persuaded to return to Spurs in 1938. Tottenham had embarked upon a steady decline since his departure, and he inherited a largely mid table Second Division side. After just one season, finishing 8th, McWilliam’s reign was interrupted once more, this time by the Second World War. He remained in charge throughout wartime football up until 1942, when his wife’s illness forced him to retire from the game entirely. On the face of it, McWilliam appears to have been a highly successful player and a semi-successful manager. Two relegations, two promotions, one FA Cup and one runners-up medal in the First Division seems creditable but hardly remarkable. The reality however, is somewhat different. The ‘Spurs way’ which is still talked about today is something which, although first moved towards by John Cameron, can largely be attributed to McWilliam. In 1923, he made a formal agreement with Northfleet United, whereby the non-league club agreed to play Tottenham youngsters, playing a style of play and taking a tactical approach dictated by McWilliam, so as to best prepare these youngsters for life in the Tottenham first team. The idea of feeder clubs seems second nature in the modern game, but McWilliam was a pioneer in this respect. What’s more, his basic achievements are Tottenham are not to be sneered at. The second place finish in 1922 was the highest finish any London club had achieved at that time, when the Northern powerhouses dominated English football. To this day, McWilliam remains the longest serving Tottenham manager in history, with a combined total of 19 years spent at the helm. His greatest legacy though, is the impact he had on others, future managers, and the gargantuan effect that they would soon have upon the British and European game. McWilliam coached and had an enormous impact upon the future’s a three future managerial greats. Vic Buckingham, Arthur Rowe and Bill Nicholson were all players under McWilliam’s stewardship. If we start with Buckingham, perhaps the most ardent exponent of McWilliam’s philosophies, he played under the Scot for four years, the entirety of his second spell at Tottenham, from 1938 to 1942. Buckingham felt the full effects of McWilliam’s management, starting his professional career with a season at Northfleet United. Buckingham, like McWilliam, played as a wing-half, and spent his entire career at Tottenham. In management, Buckingham took McWilliam’s ideas of a possession-based game to the next level. At West Brom, he began playing a style of play that was so fluid, technical and possession-based it threw many in the English game. His legacy in Britain was sullied by a betting scandal whilst managing Sheffield Wednesday, but on the continent, the magnitude of his contribution to the beautiful game is more readily accepted. At Ajax and Barcelona, both clubs Buckingham managed, he is considered one of the founders of Total Football, and is also fondly remembered as the man who handed a young Johan Cruyff his Ajax debut. Bill Nicholson and Arthur Rowe’s managerial careers are better known here in England, and both were renowned for their emphasis on short and incisive passing play. Rowe played only briefly under McWilliam at the end of his playing career. 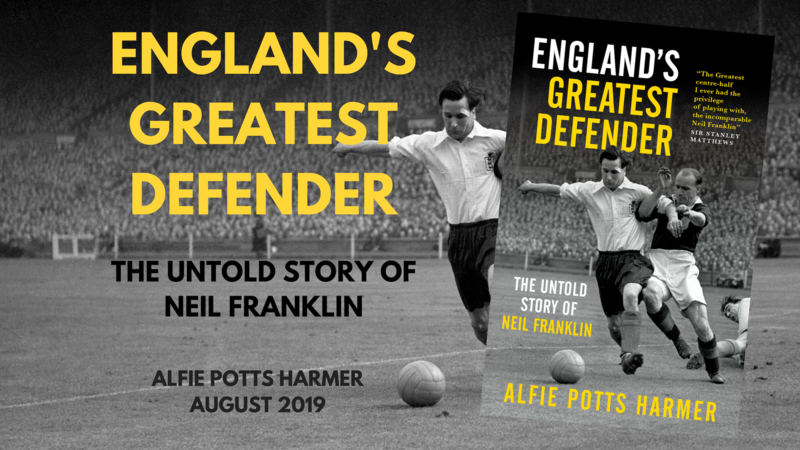 He began playing for Tottenham just after the Scot departed for Middlesbrough and only spent a year playing under him prior to hanging his boots up in 1939. Despite this, the hallmarks of McWilliam’s influence upon Rowe were clear to see when he moved into management. Despite being well-known among Tottenham supporters as being the first man to win a First Division championship at White Hart Lane, Rowe’s achievements are somewhat overlooked outside North London. Spurs were in the Second Division when Rowe took the reigns in 1949, yet he won the Second Division title in his first season and the First Division title in his second, and extraordinary achievement, which ought to rank among the finest in the history of the English game. He finished second in his third season before eventually tailing off, leaving Tottenham in 1959 and retiring from management 7 years later, aged 54. Bill Nicholson is someone who McWilliam had a decisive impact not only upon his managerial career, but also his playing career. In McWilliam’s first season of his second stint as Tottenham manager, just prior to the outbreak of WWII, he promoted two players to first team. One was Ron Burgess, and the other was Bill Nicholson. Both had incredible impacts at the club, but none more so than Nicholson, whose promotion by McWilliam marked the beginning of a 36-year association with Tottenham Hotspur. He had success as a player under Arthur Rowe, winning both First and Second Division titles, and a Charity Shield, but had far greater success as manager. In his 16 years as Tottenham manager, Nicholson won the First Division, the FA Cup three times, the League Cup twice, the Charity Shield twice, the European Cup Winners Cup and the UEFA Cup. On top of these successes, Nicholson also finished as a First Division runner-up, UEFA Cup runner-up and reached the semi-finals of the European Cup, establishing Tottenham as one of England’s first major powers in European football, and all underpinned by a philosophy he had taken from McWilliam and Rowe. When one steps back and takes a look at the development of the British game and the sport in general, Peter McWilliam stands as a giant of that story. As a player, he played in the finest team in England at that time, where he was a fan favourite, as well as captaining his national team. In management, many have won more trophies, but few have had quite the lasting impact and legacy McWilliam can lay claim to. He won an FA Cup and took a London club into uncharted territory in the league, all whilst playing an innovative and new style of play for the English game. In the form of Buckingham, Rowe and Nicholson, he coached three of the most important figures in the history of the game, and embedded in them a style that would prove so successful for all three. McWilliam died on October 1st 1951, in the seaside town of Redcar, 7 miles outside of Middlesbrough at the age of 72. It´s such a breath of fresh air to read stories like this one. Especially in today’s football landscape. We are in need of stories that inspire, inform and why not, entertain. Peter McWilliam is a prime example of discipline, perseverance and hard work in football. The “man behind the scenes” that inspired others (some unknowingly) to change the world. It would be great to make a movie based on his story. Since we’re talking Tottenham football, did you have the chance to watch the next generation of Tottenham stars play at “The NextGen Series”? Brilliant blog. In particular, your take on human interest stories. Keep up the good work. Good article overall, but …. Tottenham’s opponents in the 1921 FA Cup Final were Wolverhampton Wanderers, not West Brom.